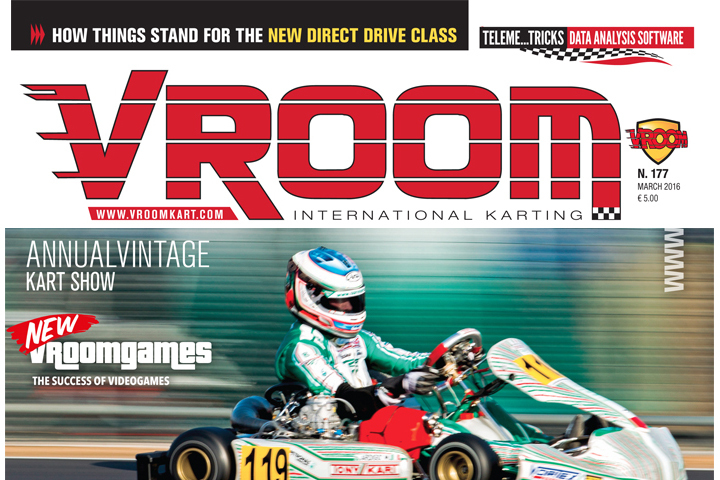 Vroom International march 2016 out now! The Winter Cup is a godsend. The new engines draw all the attention at renovated track in Lonato. It's Vortex domain as they conquer KZ2, OK and OK Junior podiums. Marco Ardigò leaves his mark with a fantastic performance. KZ what a show! Our work, creating a magazine, and printing it within a set time schedule respecting our readers who are looking forward to getting it in the early days of each month, has been going on for 16 years now, presents some incognito, especially when you edit a specific magazine like Vroom. A commitment and responsibility that we have to live with continuously without even a school bell or a siren that, tells you when your turn is over. Yes, this issue, the one you are holding is among those that transmit this reality more than the others. We have called it “moments of glory” because it responds to what we have lived on the track and in the news room over the last 10 days of February. From the Winter Cup in Lonato, that has returned to its former glory for a number of favourable coincidences, and our satisfaction of being able to publish in just 3 days (as if it were a weekly magazine) a sensational magazine. Yes, sensational, because it’s the first time in the history of publishing in this field that a magazine manages to publish track test with so many details in such a short time. The satisfaction is even greater if you think that this test was set up at brief notice, thanks to the kindness of Tony Kart team, and in particular two brilliant Kosmic mechanics, Alessandro Fracasso and Thomas Mardaga. Yes, because on that fateful Monday 23rd, there were two Kosmic karts there for the team from Vroom: Patrik Hayek’s KZ and Karol Basz’ Ok. And, at that point, Andrea Saccucci and Daniele Parravano (OIP) set to work and in just one hour they transformed the two karts into hybrid karts, seeing the number of cables that entwined connecting lots of sensors to the data logger. A moment of glory, when in the end we realised that after a frenetic and exciting day’s testing with the incognito of possible rainfall, the data we picked up led to believe that, if we had had a bit more time we could have gone below the 46”4 lap time stopped by Hayek. The sensation we got seeing Patrik’s grin for having beaten by 3 tenths Fabian Federer’ s pole in KZ2 was fantastic. A sensation that we’d like to transmit to you too, our readers reading this column written, as usual, by Maurizio Voltini with the help of Andrea Saccucci Officine in Progress team manager, the same one who sees to the newborn column “Telemetricks”, a useful guide for understanding telemetry and how to make the most of it to be able to help improve performance. Another innovation that younger readers will enjoy is the new column “VroomGames” dedicated to videogames and driving simulators curate by Ayrton Becherini promoted to Vroom mascot Vroom. Ayrton represents a kart driver of the mew millennium and Vroom well, his racing DNA came out compellingly when he was reading the magazine back in 2001. For those who haven’t seen it yet, it’s important to watch the video https://www.facebook.com/1536552809930779/videos/1654374364815289/: dedicated to those who still have doubts on the function of Vroom at the newsagent’s ... Yes, life is also made up of these small satisfactions: allow me to say: like being the only international karting magazine printed and diffuse throughout the world. PAG. 26 - ARE THEY REALLY OK?